It was going to be hard to top last season's 40th anniversary extravaganza, but Sonia Rykieland her daughter, Nathalie, came up with something that—although it was much smaller in scale—brought just as many smiles to the assembled faces. The concept: Get the models to talk to the crowd as they took their turns around the designer's Boulevard Saint-Germain boutique.It was going to be hard to top last season's 40th anniversary extravaganza, but Sonia Rykiel and her daughter, Nathalie, came up with something that—although it was much smaller in scale—brought just as many smiles to the assembled faces. The concept: Get the models to talk to the crowd as they took their turns around the designer's Boulevard Saint-Germain boutique. Hej hej! Thanks for all the supportive comments on the first Sweden post! I do just crank out whatever I think and do no editing or cutting on posts so I'm glad it can make some sense! I'll try to remember the past week but it's all merging into one now! This is quite bad as I have to keep a daily log for part of the course but these posts will help! So I left I think at the end of the first day, once I'd gone off to buy a quilt and hairdryer, etc. I got to see that here there aren't many shops. No Monki sadly. No Weekday. No Acne. People associate Sweden with high prices and they are not wrong. I think it's more of the fact that there are no bog-standard, cheapie prices. For example, I didn't bring any pens or paper here, so I was searching for a shop that just sold a simple pack of biros. The only place I could find was a stationary shop that is probably comparable to Paperchase, and the cheapest pen (the bog-standard biro you might get in a pack of 20 for £1 in the U.K.) was equivalent to about 50p. Hmmm. Food isn't too much more, but again there are not many cheap alternatives. This leads to another typical part of Swedish culture, Jantelagen: the Jante Law. This Scandinavian concept means that you should never appear better than anyone else or think you are better than anyone. This seems to be why Swedes seem quite shy and reserved, because they don't want to talk about themselves or big themselves up. So most people here all belong to a middle class, and therefore the food available is all around a mid-price point. 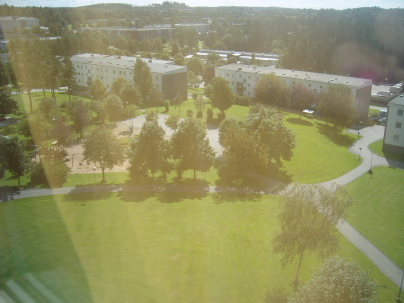 This is a bit of a change from England, where I know that my parents and Nan are telling the world that I'm in Sweden! So after another night of chatting to my Iranian flatmate, the Warwick girls were heading into the city and I went along. They really are so welcoming and I get along great with the girls on my floor, it's a shame they're here for only 3 months! While I like being by myself and trying out new things independently, it's nice to be part of a group where the conversation is not a battle of translation and it's something familiar. 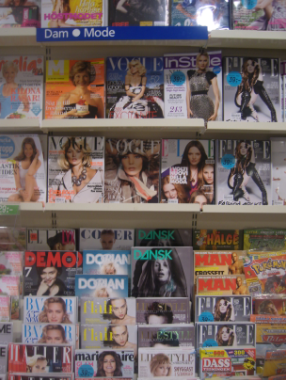 We decided to go back into the shopping area, Knalleland, and have a good browse and to sort out banks and phones. 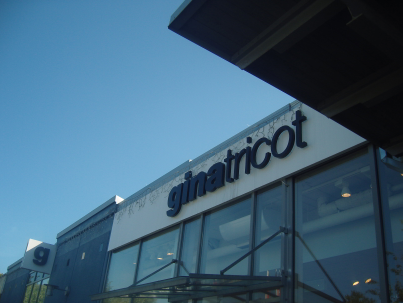 This was my first trip in Gina Tricot. It's such a great shop!!! I'd say it was in the middle of Topshop and H&M. They have a few more detailed and embellished things than H&M, but it's not as glitzy as Topshop. Remember, the Swedes are not into glitz! I wasn't out to spend loads as I'm waiting to hit the shops in Gothenberg, but we all ended up with something! I'll show you what I bought in another post, but it was a dress with a bow print (how typical!) and a bag with a studded bow (again how typical!!). I'd say the prices here were 1/3 more than they are in the UK, definitely in H&M as I could compare them with prices I remembered from England. I asked the sales assistant if most girls wore Gina Tricot and she said, 'Yes, every girl has this dress!'. So it looks like all the things I will buy here will have to be worn in the UK and I can wear all the brands I would avoid in the UK here, e.g. 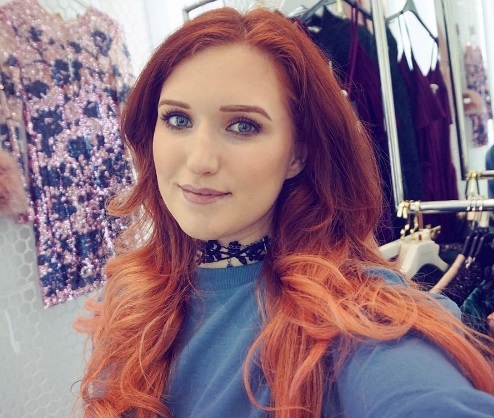 the sell-outs at Topshop and New Look. Now my eyes are out on stalks for Swedish style. And this city has not let me down! Hair buns everywhere!! Of the young people I have seen, they do wear very simple, clean clothes; no brash accessories or bright colours and patterns. Many of the teens are scene/emo kids with coloured, backcombed hair. Here's a sneaky snap of three men just sitting in their light shirts and white trousers having a chat; very Sartorialist. 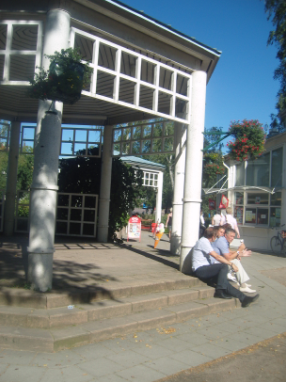 Lunching or having a 'fika' here is very important, Swedes LOVE coffee. Pity I hate the stuff! It is of course very, very clean too. There are lakes and river through the city, cobbled streets, and much greenery and forests. This feels different because it's not like in most UK towns; there the plants and grass was actually put there on purpose and looks odd, it's almost like here they have built around the nature and it is undisturbed. 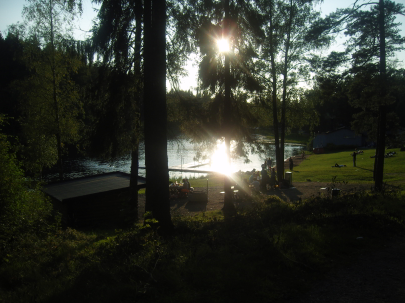 After a long day of shopping and working out money and then chilling by the river in the sun, we headed back to our halls and debated on walking through the forest to a lake. It's so funny to look out my window and see such a huge, dense forest. We were tired but thought a walk wouldn't do any harm, so after dumping our shopping we headed down the path into the woods. The lake is about a miles walk, and we kept stopping the joggers and walkers to point us down the right path. The forest is SO thick, it's hard to believe this is right next to a thriving town and hasn't made way for more buildings or houses. Also the Swedes are so fit and healthy, there were many joggers throughout the walk and people riding horses. We laughed about forest parties and probably venturing into the forest when drunk for a Blair Witch-style adventure. We came across baby frogs and rabbits until finally reaching a beautiful lake. 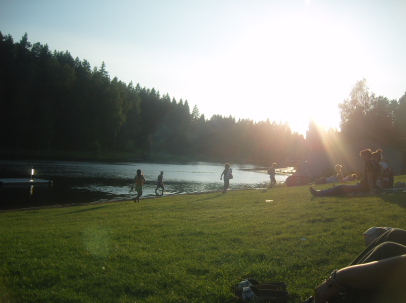 There were many people there enjoying the last of the summer sun, and it's not pictured but there were boards or a pier or whatever you call it, where people where jumping into the lake and messing around. A family showed up and left their pram and all their bags while they took their little children for a dip in the lake! The next day was our first introduction day, where the new exchange students had many, many talks in a huge lecture theatre. I'd say there was about 150 of us, and I spotted the other girls from Manchester, who I didn't know previously as they do textile design. They are in different halls down the road which are more like flats, rather than together as larger floors. We actually had a welcome from the head of the whole uni, a lovely blonde woman who invited everyone to greet her by her first name when they saw her and have a chat. In Manchester, I haven't a clue who owns the uni, although I think it's an architecture company? In fact I didn't even have a tutor! You might notice I'm comparing here to the UK and Manchester uni loads, which you can't really help as that's just what you do naturally! I'd met all the people in our flat by now, there being three (or maybe it's two) Spanish boys, a Spanish girl, us three English girls, the Iranian guy, a Chinese girl and her Swedish boyfriend, who when we asked him where he was from said very slowly, 'Ah... I am from a very...very...far away country........ called Sweden.' Ah those Swedes are so cool, and it seems a bit sarcastic! There's also a girl from Pakistan in my flat and a German girl who reads fashion blogs!! She came with us to the first introduction day and as she does my course, I happened to ask if she read blogs and she knew loads! It's so cool to live with someone who reads some. She has great style too. During the intro day I had lunch with the Manchester girls and met the other English students, who also do Textiles, from Chelsea art school. They are very well spoken and one girl wears sailor clothes, sweet! Later everyone set up their internet but a few people like me had already done it, so we hung around the side of the computer room. The guy telling everyone what to do was hilarious and stopped and stared at my legs before saying 'Ja! You have nice pattern!' about my heart print tights! They were my last Topshop purchase after a long Twitter discussion with Winnie from Diamond Canopy! As I stepped to the side, the other people who had already done internet was a group of little Asian girls. By now it was apparent that the Spanish people will hang with the Spanish people, the Pakistani people will hang with the Pakistani people, and the Asian people will hang with the Asian people (to clarify, I mean people from China/HK/Japan/etc). And to be fair, us English people were hanging out with English people! I don't mean this is everyone and all of the time, but in general you see this even in England, and there are many Chinese people in my classes at home who I have never spoke to. But I'd love to go to Asia and of course have a Hello Kitty love so I just thought why does no one talk to the Chinese people? So I was like hiii! and I introduced myself. And turns out the girls were from Taiwan and they are the sweetest, most lovely girls ever!!! They were like, 'We're from Taiwan, have you heard of it? Do you know it?' I was like yes of course! Over the next few days they took so many photos and I will try to get some to show you! I asked around but it seemed people weren't going in heels and were pretty casual. I brought with me all of my American Apparel dresses, my playsuit, and a strapless, sort of tube dress, which is what I wore with some little shorts and the heart print tights. 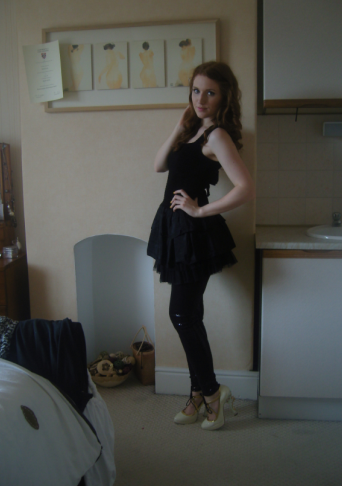 I folded up the dress so it was more of a top but pulled down later to be a dress! 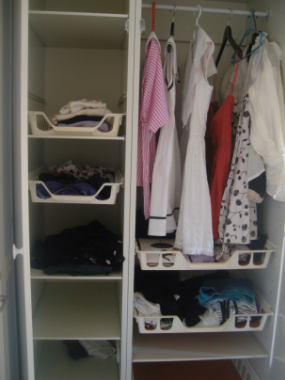 The Swedish also have another custom called lagom, which means just enough, not too much or too little. So Swedes are rarely early or late, they are just on time. We assumed that the student dinner wouldn't be a fancy affair as it was a buffet, and thought that people would be standing around and chatting. So we rolled up (on the bus, haha) at about quarter to 8, as it started at 7. As we walked in, it looked really empty apart from the student corps, but as we signed our name, we were told to take a number. I was last in line so as I walked through the door, I was thinking huh, a number? Turns out, each table had a number and so we had to sit where we were told with people we didn't know!! The room was already full, I think we were the last people! After the immediate shock and thoughts of 'aaargh!! ', I found my table, which sadly wasn't a circle of five like most of the others, but a long one of about twelve people. One of the Manchester girls was there but I had to sit at one end, so could only really talk to the people around me. I spent the dinner talking to a French girl opposite who had been an au pair in England before, and was doing Library studies. Seems it is learning about being a librarian, so it's harder than I thought! In the talk about the library during the day, everyone fell asleep, I felt so bad for the speaker! The other three nearest people were Spanish, so they spoke to each other in Spanish. It's hard to make conversation to distract people as it's harder for them to create answers and you have to search for common grounds. Although, I found one was actually in my flat I think, and as the two most nearest Spanish people went to the buffet, she moved over a seat and said, 'Hey in England, do you know the programme, eer, Skins??' I was like wow yes, Skins is a total phenomenon here practically!! She said I reminded her of Cassie, which a few people have said to me before and I think it's more ditzy actions than looks, weird! Ah and it has to be said, the buffet wasn't what I expected. Well I didn't know what I expected, but it was potatoes, salmon and meat balls, and tomato, lettuce and cucumber. So I had some potatoes and plain salad, which might not have been a good idea since I hadn't ate hardly anything since I'd arrived. It was partially being a bit nervous to cook in the kitchen, as the utensils and pots and plates are all communal and mismatched, as so it still felt like I was invading someone's space. Also, have you every tried cooking pasta in front of an Italian, or a stir fry in front of a Chinese person? Of course I know loads of Asian people at home, but they live in England. Everyone here is straight from their own culture and the English aren't exactly known for their food! For example, the three Spanish boys came in to make their dinner and they created a fresh salad with grilled chicken and fresh bread. In England, student boys seem to live on a diet rich in Pot Noodle and frozen pizza, so seeing boys sit around a table, break bread, and decide to make a salad. It's so different! I'm generalizing quite a bit about England, but that's just the way it feels. I was waiting for some kind of game or quiz during the dinner but they just sat us there and left us to it for three hours. Some of my friends on tables of five sat there in silence for most of it! I forgot to mention that they said no alcohol would be served all night but we could bring our own. Sweden has some crazy alcohol policies! First, you can only buy alcohol from one place, a shop called a Systembolaget, which is open only in the day and very few hours on weekends. Imagine a very posh wine shop in England. I got a litre of vodka for over £20!!! Alcohol is double the price! They don't have any cheapo alternatives as I mentioned before, and I found a bottle of Jacob's Creek wine for about £7, which I took to the dinner. I shared some with the French girl so I was pretty tipsy through the night as I'd not ate very much. We all move onto the student club, which was a little basement with a stage and a DJ on a laptop. We met some Irish guys too, which the Manchester girls were very interested in as they're almost like a cool novelty as they are English speaking and the English love the Irish. They were pretty hammered though! Something new to note is that people here dance CRAZY! This became more apparent in the next few days, but I guess that night it was because everyone was from totally different places. The night split into people sitting and watching the people on the stage, who were doing some insane dancing! The music ranged from cheesy chart tunes that we knew, to random songs that make all the German people cheer and dance like crazy, or the same with other nationalities! This post is already again miles long so I'll leave it there and continue tomorrow! Tonight is a night for the new students, but we had a bit of trouble getting in on Monday so I hope it will be OK! Hiii! There's been so many times in the past week I've sat down to write here, sorry to keep you guys in the dark! I have loads to say and don't worry, this blog won't become a diary of Sweden living, in fact it may become more fashion obsessed because people truly do have such amazing style here! 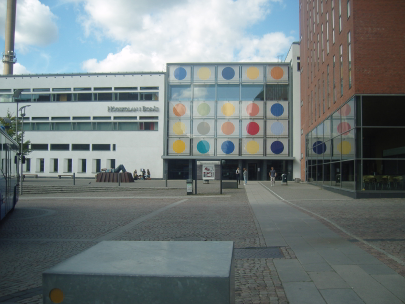 But right I'll start from the beginning and clear up that I'm in Sweden for the year doing like an optional year out to take a few classes here. They count for 10% of my final year and I only need to do 30 credits and a 30 credit report, so there's only four classes! I'm still doing textile management here and the courses are taught in English to the international students. Ah and I'm in Borås, which is about 30 mins from Gothenberg and is famous for their textiles! The uni I think has around 9,000 students, which compared to the 100,000 in Manchester is a bit of a change! So it's been stressful all summer to organise and in the end I could only take ONE suitcase. One! For a whole year! Some friends came round the night before and I went through my whole wardrobe SATC-style and basically took my absolute favourite, wearable things. The shoes below stayed at home, sadly! I might bring them when I visit home though! I was still packing at midnight and when I managed to shut the case, it was ripped! So I had to pack another bag and couldn't fit my tripod in. I'm buying a new one though so no problem! I got my Luella bag in as it's way too heavy to carry as hand luggage, so it's not all bad! It was pretty sad to say goodbye to my Mom at the airport but I can come home and Skype is free! There are three other girls from Manchester uni here but I didn't know them before as they did textile design, and it turns out they all came with their parents! 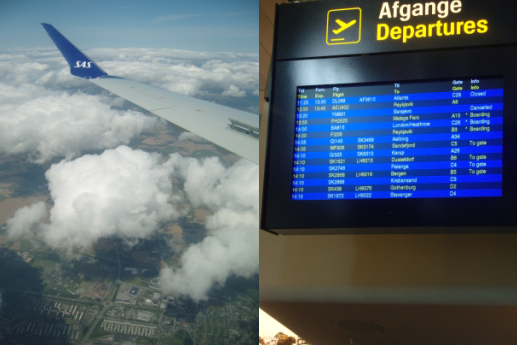 I like doing things by myself and was exciting to change at Copenhagen, a city I'd love to actually leave the airport of! I think I've said before that I hate flying, but I read the new Georgia Nicholson book and a guide to Sweden, which was pretty rubbish to be honest! The first sort of taste was in Copenhagen, where everyone around was very tall, slim, makeup-less, tanned, and had their hair in buns on their head. Moving abroad is so different to being a tourist because you're not with your family or friends in your tourist bubble. You have to do practical things and find places like the supermarket and pharmacy for your daily life along with the people who actually live there and speak the language, not just souvenirs or holiday buys. On the flight to Gothenberg, there was a little bright blonde boy babbling to his Mom and loads of people chatting but it's so strange to just sit there clueless to what the person right next to you is saying. It's not like a novelty like on a summer holiday because you're alone and you have to adapt for survival, rather than just observe it. My journey was pretty complicated as I had to then get a coach. As I was waiting for my bag, another flight came from Spain I think, so I was surrounded by Swedish people. I'd never met a Swedish person, have you? Suddenly all these blogs are coming to life and all around me were amazingly tall, tanned, blonde girls with yes, the hair buns and little denim shorts and white pumps. It's so strange! I was wearing a black dress and long, lilac cardigan but felt so odd and out of place, and actually kind of short! I found the coach OK and people were just chatting at you in Swedish, to which you have to keep saying 'Sorry, English???'. A main characteristic of Swedish culture is that Swedes are very modest. I'll talk about this later as it kind of explains Swedish fashion blogs, but everyone you speak to will apologise for their bad English, when in fact they are amazing!! I keep remembering that I was originally going to Hong Kong and am so thankful that almost every person here speaks English (they stopped the HK programme for the year boo!). I counted the stops on the coach and found some taxis to head to a hotel to pick up my room key. I chatted to the taxi driver about the town and it all looked so odd. It hits you at first how everywhere looks so foreign and the city is nothing like England. Everything is so clean and unpolluted, the roads are wide and there are no sky scrapers, the traffic is slow, all the houses are detached and look like gingerbread houses. It's just so calm! My flight was at 10.30 and it was now about 6pm, so I got my key and the driver drove down large roads surrounded by forests for around five minutes before pulling into an area of tower blocks and halls. 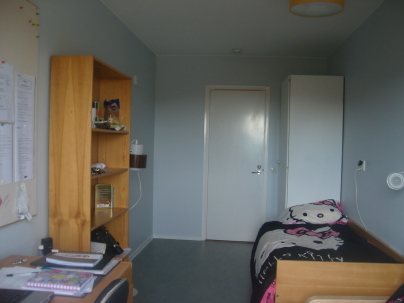 I'm living in student halls for international students. There are two sets, the others are down the road. I found out I was on the 7th floor, the top! I walked in with a German girl who said hi and I was thankful I was in the right place! We had a little chat in the lift and I accidentally hit the 6th floor before going up to the 7th and seeing my lovely room! The view is unbelievable!! I pieced together the pictures at the start of this post to show what I can see all around. Every time I look outside, I can't believe I live here! 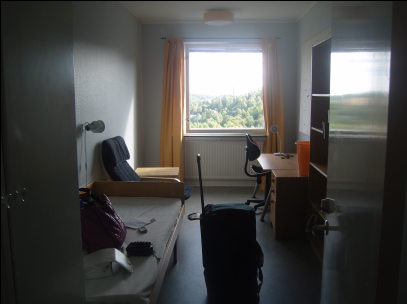 I just looked out for ages and ages until checking out the room, which is a million times bigger and nicer than my old student halls. If you've been in student halls, or even moved in anywhere new, at first it's so alien and can feel a bit grimy. I've got loads of storage space, which is a bit of a joke since most international people can only bring a limited amount of stuff, me having only a suitcase sized amount! Our floor has four flats, each with four rooms and the fourth flat being a common area with a laundry room, kitchen and dining area, and two sitting rooms! It's amazing! I wasn't so nervous to be there as I've been a fresher before, but I found myself really scared to investigate the bathrooms and kitchen. It's just that fear of the unknown and not knowing who you're going to meet and what's going to happen. Like your whole future year can be decided in the first second of meeting new people, and it still felt like I was living in someone else's place. 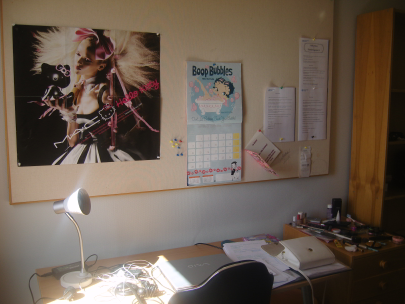 There are two bathrooms in each flat and there was already posters everywhere and people's shampoo, and it's so scary! It's all a bit of a jumble but I forced myself to go look in the kitchen, and met one of the Spanish guys who lives here sitting with more Spanish people watching the TV (yes we have a TV in our halls, luxury!). I was like hi! and we introduced each other and I said a few random, silly things, then went to unpack. 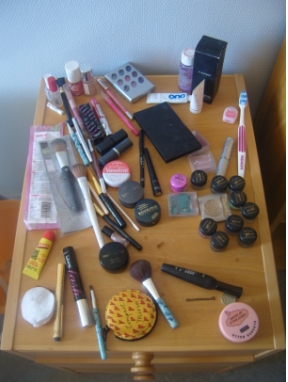 I really wanted to wipe everything down a bit but once my stuff was arranged it felt better! Sadly I couldn't even bring a quilt or pillow so the first night was not comfortable! My mattress is about an inch thick but I managed to find a mirror in one of the hall cupboards after a few days so that's one thing! Then I sort of bided my time. I was a bit scared to go back in the living room as everything is so unknown and I didn't know what would happen or who I would see, and if I'd do something wrong. Also I had zilch food or drink and had no idea if anywhere would be open that late or where to go, so I was a bit lost. My internet wasn't hooked up and my phone doesn't work here so I was just battling with myself finding things to do. I did go back in the kitchen and I think I met another of the spanish guys in there. Apparently this place has been refitted with a few things and there is three people to a fridge, but my fridge was full of stuff, scary! Maybe that wasn't when I met anyone else, as I went back in my room and debated whether to just go to bed or finish the book. It was about 9pm and I walked out to brush my teeth for bed when a guy was like hey, you're my new flat mate! 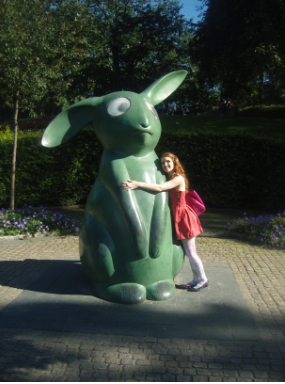 Some people have been here for years or since the start of the summer to take a Swedish course and I was happy there was someone friendly to meet! He's a guy from Iran, which kind of highlights one of the great things about living in international halls because you actually meet people from those countries you only hear about on the news and they give you the real deal of where they're from! So a few hours later I was sitting in his room listing to him play some crazy sitar type instruments I'd never even heard of before! Meeting guys here too highlights how less sensitive typical guys in England are, as he was telling me about all the songs he has wrote and how the music makes him feel, aww! Then about midnight some English girls arrived! There are six girls from Warwick uni here for three months working in nurseries as they study education, two who are on my floor, one in my flat. They all came up and the Iranian guy was like wow, there are so any English people in my flat! The girl next door to me actually has a balcony!! It was so strange after going through the journey and feeling so alien, to actually meet a load of English girls. They were all gossiping and checking out rooms and a few said they wanted to go home! Meeting some lovely girls though is so lucky as a few hours later I was chatting with both the two new flatmates, feeling a lot like a fresher again. We were all desperate for internet asap, and I had planned to go to the uni the next day to get the code, but now I had people to go with! But first we headed to Netto, the nearest supermarket, two minutes away. This took about two hours haha because now I was in a big group of girls! As you probably know, things are more expensive here, although not too much for food. Swedes seem to stock up way more because you can only buy HUGE amounts of cheese at a time, and the juice cartons are massive! Or maybe the english have smaller items? I tried to avoid the hello kitty socks they had as somehow I have brought a hello kitty bed cover, poster, tattoos, bag and hair clips! Then in the afternoon we went up to the uni, which is lush! Being at Manchester makes you feel quite anonymous so it's nice to be in a smaller uni, and a lovely one too! 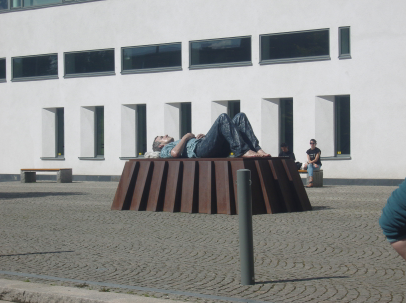 This statue of a huge 'student' makes for pretty funny photo opportunities! 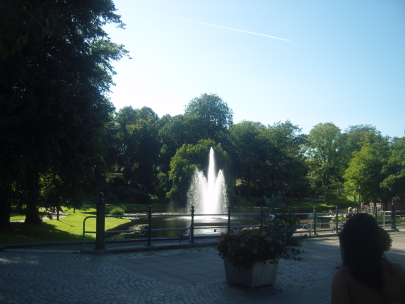 It was still quite quiet around as the term hadn't officially started, and we started to realise that Borås is a very small but very pretty town. We met the exchange coordinator, who all the girls love (and it's not hard to tell why!). Only I could get the internet for some lucky reason so I went off with him to get my code while the other girls went to meet their tutor. Then I went off by myself to search for Knalleland, the shopping centre. This was a bit of a revelation as it's where I'll essentially be shopping for the next year, and it ain't exactly big. There are lots of malls surrounding a big dual carriage way and I went from shop to shop, asking directions to the next shop that would sells hairdryers and bedding, etc. People are so helpful! Then I saw a beautiful sight. Gina Tricot!! Lindex!!! DinSko!!!! It's SO fun to spot all the Swedish shops that I've read about on blogs before and I can see myself buying LOADS of things to wear in England!! I didn't have time to clothes shop but went the next day! I will have to tell you about it tomorrow as this post is so long already! So to be continued... then I can finally talk about the fashion! Thanks for not abandoning the blog!! p.s. Did I mention yet how fashionable it is, and how HOT the guys are...?! Ah these weeks have been a bit of a headache! Sorry for the hiatus, things have been really up and down lately and I'm bobbing around trying to cling on. It was my birthday on the 5th so I had two good nights out, the first in the pink American Apparel dress, cat ears and hello kitty tattoos. I spent the last few hours with my sister and so didn't get home until about six. I lost my camera (again) too, oops. Then I was out on my actual birthday to a club that was doing chlamydia tests for free Kanye West sunglasses and wore sequin leggings and a pink sash. This involved ears too, which I kept getting glimpses of on random heads throughout the night before spying and retrieving them at the end. 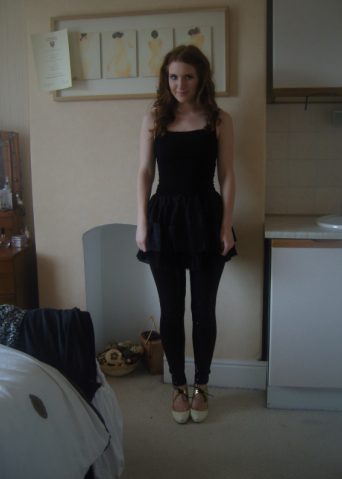 I was going to wear one of my tried and tested outfits, but wore the leggings I got in London for a change. The club was so busy that I don't think anyone saw anyone else below the waist anyway! And at least I knew to avoid every guy with the free sunglasses on their head! 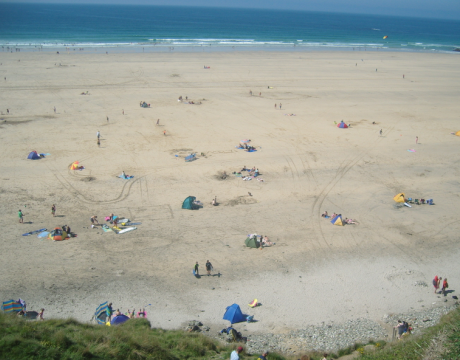 I also went to Cornwall on Monday for two days with my oldest school friends as her family had an apartment in a holiday park. This meant a super cheesy disco, us checking out the moody teenagers, and my friend Tom pining after the one of the DJs in his awfully jazzy stripy entertainment blazer. Haha! My friend has a little girl and I don't know whether people were staring because there was a baby or because they're in their early twenties but people stared loads. At first I didn't want to get my hair wet but ended up being knocked down repeatedly by the waves and flashing my friend's little cousins about ten times in my H&M bikini. At least I had chance to wear it this summer! Apart from that, things are all getting a bit stressful inbetween everything as I go to Sweden next week!?! It feels like I've got ten thousand things to do but still have terrible internet here and my brothers and sister have constant mates trouping in and out the house. My Mom is getting annoyed and made these charts to write down all the chores we do each day because the house is trashed when there are 20 teenagers around all the time. Inevitably, they are now graffitied with rude words and doodles. Have you seen Superbad, where Seth kept certain drawings in his lunchbox when he was a kid? Yeah, those charts kind of look like that now! So that's what I've been doing. Who would have though moving to a different country was so stressful? Ha, you know so! I'm one of those packers that like to do everything at the last minute, I mean how do you know what you want to wear until the morning? And what about all the things you need to use before shutting your case? Today though I'm taking a break from worrying about flights, coaches and taxis and still not knowing any Swedish, to contemplate whether to take my fixed Miu Miu shoes to Sweden? I'm afraid that, with this house being the social centre of Birmingham so it seems, it makes me a bit nervous to leave things behind. But really, I'll have to leave loads of stuff anyway, and a shoebox takes up a lot of room in a case. Right now I'm trying to sort out phones and banking. I've been a fresher before and went to college without knowing anyone, so I'm not scared about meeting new people, just about getting there! I think I've mentioned before, I'm staying in the international halls so should have new friends from all over the world, hopefully! Earlier I broke out the shoes again for maybe one last time before leaving. If only I had a Carrie Bradshaw-style closet to display them in and a Naomi Campbell sized luggage allowance.